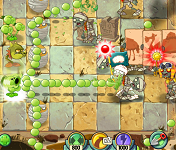 Here's a guide for the "Effects of Plant Food on Plants" in the action and arcade defense game - Plants vs. Zombies 2: It's About Time!. Supercharge your floral friends with healthy doses of Plant Food! 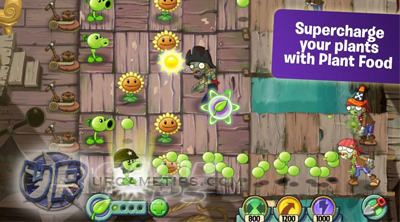 To get Plant Food for your plants, disable those shiny green zombies to get one free, or buy them for 1,000 Coins each by selecting the green "+" sign next to the Plant Food bank below your game screen. - By default, you can only have up to 3 Plant Food per game, unlock more slots as you progress through the game. 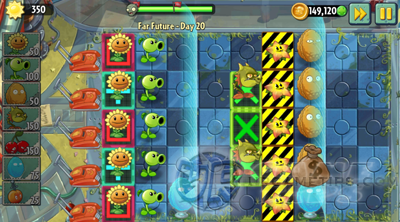 - Plant Food doesn't carry over between game stages, except in Challenge Zones. Lilies cannot be enhanced with plant Food. - Effect: Instantly produces 150 total extra Sun. - Great for boosting out your Sun value to deploy more plants! - Effect: Shoots a huge barrage of peas in a straight line. - Effect: Gives them an extra layer of armored defense to be able to absorb more incoming damages. - Probably one of the most preferred plants to use Plant Food on. - Effect: Hides underground then spits out 2 Potato Mines into random locations in-front of it. After that, it will just pop out back from it's hole, waiting for it's next victim. - Effect: Launches a number of cabbages that hits all zombies on the map. - Effect: Shoots a huge barrage of boomerangs (up, left, right, and down directions) for roughly 3 seconds. - Even though it can hit up to three targets twice in all 4 directions, it's damage potential is still not quite great. It could be useful on certain situations though. - Effect: It freezes all zombies on the screen! - Effect: Dishes massive blows to all nearby zombies around it (all directions) for 3 seconds. - Effect: Shoots a huge barrage of peas in a straight line for 3 seconds, then finishes off with one huge pea at the end. - Effect: Not applicable to this plant! - Effect: Instantly produces 225 total extra Sun. - Effect: Will freeze or slow down all zombies in front of it first, then shoots a huge barrage of slowing peas in a straight line. The effect lasts for 3 seconds. - Effect: Launches a number of butters that hits and stuns all zombies on the map for around 8 seconds. - Effect: Floats above then fires a massive flare bombs on a 3x3 area directly in-front of it. - This is a great effect for clearing out zombie mobs in front, nice Area of Effect plus ton of damage! - Effect: Thrusts spikes from the ground while drawing in nearby zombies. - Effect: Fires a huge coconut cannon ball that pushes enemies back then explodes! - Even if your deployed plant is under cool-down, you can still activate them. - Effect: Bounces back all zombies nearby. - For best results, use it on stages with water. - Effect: Scatter shots a huge barrage of peas targeting all lanes for around 2 to 3 seconds duration. - Could be useful on certain situations, but most of the time, it's not that effective. - Effect: Jumps then smashes up to 2 random zombies on the map, regardless of their locations. After that, it will go back to it's original place. - Effect: Shoots a huge barrage of peas in a straight line (left and right), then finishes off with one huge pea at the end (left only). - Just imagine that you have a Peashooter facing to the right and a Repeater facing to the left. Refer to the above mentioned plants, for sample animation images. - Effect: Creates a green smoke screen then spits out 3 Chili Beans into random locations in-front of it. After that, it will just pop out back, waiting for it's next victim. - Effect: Permanently turns the Torchwood's fire into a blue colored flame, giving all peas that passes through it - a triple damage boost! - Probably one of the best effect in the game because it is permanent! - Effect: Casts a storm cloud that flies around and strikes lightning at zombies for a set amount of lightning or damage. - While the storm cloud is active, the lightning reed can still attack other zombies! - Effect: Transforms into a giant peashooter that can fire up to 5 massive peas that can deal devastating damages in a straight line! - It looks like the effect doesn't change even if you don't have a full Pea Pod. - Effect: Launches a number of melons that hits all zombies on the map for double damage! - Effect: Same with Melon-Pult above with added slow effect. - Effect: Depends on the imitated plant of your choice. - Non playable plant, but gives you rewards in Zen Garden. - Effect: Jumps then shoots a powerful laser hitting all zombies in a straight line. - Effect: Blasts a giant Plasma Ball in a straight line. - Effect: Shoots giant stars in every direction. - Effect: Creates a line of shield for the entire Column. This one is very useful, especially for blocking zombies that are thrown at the center, or to reinforce your Wall-Nuts or Tall-Nuts. - The shield will fade out as it absorbs damage, use another Plant Food to restore the shield. - It doesn't stack though, so only use one per column. - Effect: Shoots a long rainbow ray to the nearest zombie, dealing massive damages! - PF: Glows and when eaten by any zombie, that zombie will turn into a Gargantuar! - Trick: Right before the attack animation of the zombie starts, quickly use a PF on it, if successful, the zombie will turn as your ally and the Hypno-shroom will not be consumed. - Best used against tough zombies. - Sun-shroom will grow quick and will start to produce large Suns. - Shoots a barrage of attacks, still weak though. - Attacks and knockbacks all enemies on the lane in-front of it. - Glows and when eaten by zombies, that zombie will instantly turn into small Suns. - Effect: Shoots a huge barrage of peas in a straight line, and will also gain additional armor. - Collects all metal objects then uses them to attack zombies directly in-front of them. - Pulls all zombies in it's lane, then eats them. Survivors will be pushed away. - Summons more Lily Pads to all adjacent tiles. - Randomly pulls down 3 zombies in the area. - Throws 3 powerful bulb balls. - Fires seeking shots at targets! - Releases 2 Guacodiles to bite all enemies they encounter. 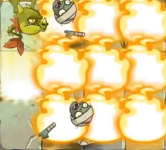 - Fires bananas that damages all zombies on the map. - Effect: Launches a number of peppers that hits all zombies on the map. - Effect: Constantly knockbacks all zombies in-front, and regenerates all leaves. - Effect: Burns all zombies in a straight line. - Effect: Stuns 3 rows in front of it, including the 3 tiles at the back of it. - Effect: Shoots a barrage of projectiles along the four diagonals. - Effect: Shoots a powerful laser, hitting all zombies in a straight line. - Effect: Cracks the ground and damages all zombies in a straight line with scorching lava! - Effect: Lobs bigger projectiles to all lanes that bounce from zombie to zombie. - Effect: Slows all zombies on the map. - Effect: Will grab a zombie that is within the 3 columns in front of it, will also instantly recharge a chewing Toadstool. - Effect: Sens out a a sound wave that damages all zombies within range. - Effect: Evolves their thorns into a nastier one, giving more damage to their attacks. - Effect: Will randomly plant 3 more Celery Stalkers nearby. - Effect: Diverts all zombies in a straight line, into other lanes. - Effect: Hits 3 targets max, can 1 hit kill Gargantuars! - Effect: Lobs 3 projectiles that hits zombies with higher damages. - Effect: Gets an extra layer of armor, similar to Wall-nuts. - Effect: Instantly produces 225 more Sun. - Effect: Similar with Snapdragons but breathes icy mists to freeze and damage zombies in the 6 tiles in front of it. - Effect: Hides underground then spits out 2 Potato Mines into random locations in-front of it. - Effect: Instantly produces 75 more Sun and creates a small barrier. - Effect: Shrinks all zombies! - Effect: Hurls 3 leaves into enemies in front damaging them greatly. - Effect: Inflicts poison to all zombies, damaging them over time. - Effect: Lobs an explosive bud that greatly damages a 3x3 area. - Effect: Works like a Potato Mine, unleashes 2 more in front. - Effect: Drags down a tough zombie from another lane.